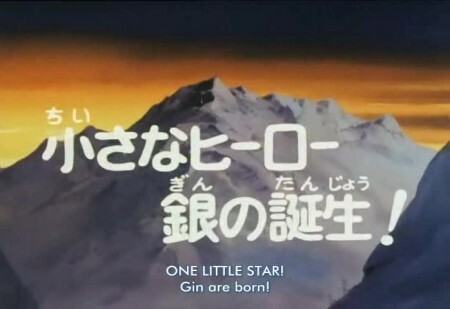 I know I kept saying that I was going to do a parody for this, but having rewatched episode one, I can see that Gin does not lend itself to parody as readily as its successor. Instead, I’ll be adopting a different format- a paragraph or two five of tongue-in-cheek summary, followed by a guide to some of the more hilarious screencaps of the episode. 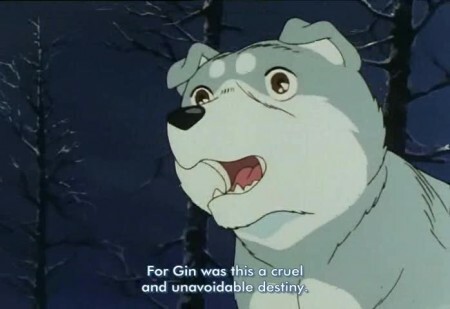 And so, without further ado, let the fun commence…Ginga Nagareboshi Gin is, unsurprisingly, the tale of a dog named Gin, who is DESTINED to gather allies and eventually defeat the evil black bear, Akakabuto. 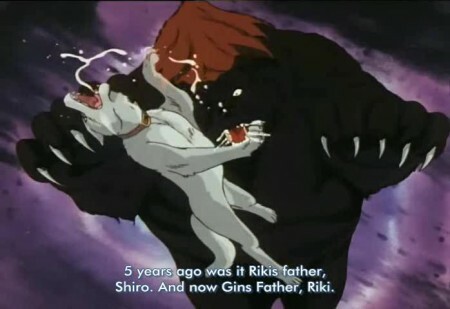 Oddly enough for a final boss, Akakabuto appears in the very first episode, killing Gin’s grandfather Shiro and later causing problems for his father Riki and owner ‘Grandpa’. 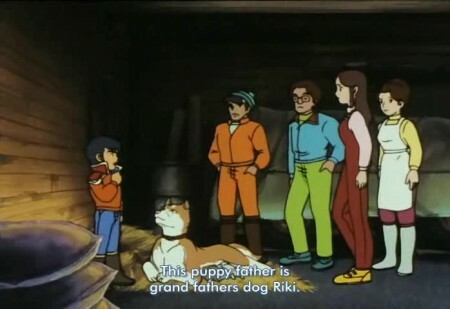 Whilst Grandpa and Riki head out in futile retaliation against an enemy that cannot die for another twenty episodes, we are introduced to grandson Daisuke and the newborn Gin- already marked out for great deeds of destiny just scant hours after his birth. 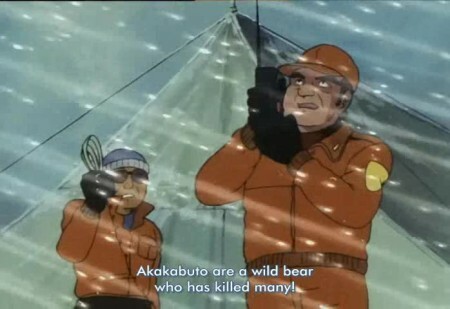 An excited Daisuke wants to show the lead character of destiny to his grandfather and Riki, but unfortunately both are missing following another bear attack. 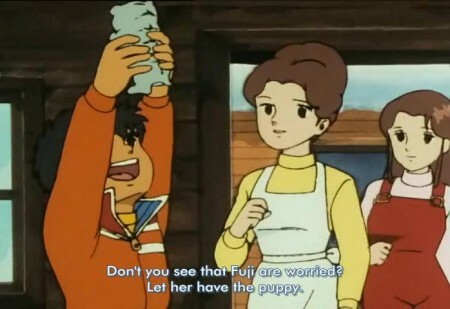 What better thing to do, then, than for young Daisuke to take the defenceless puppy out onto the bear-dominated mountain in an attempt to search for Grandpa? 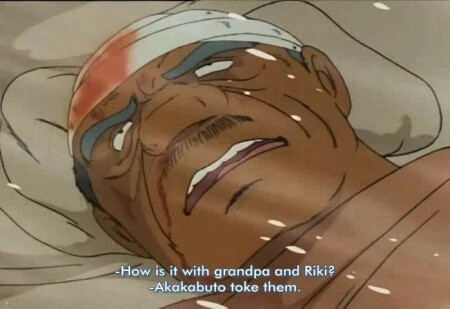 First, however, a week must quickly pass, leaving the injured Grandpa and Riki trapped in a cave after a run in with Akakabuto. 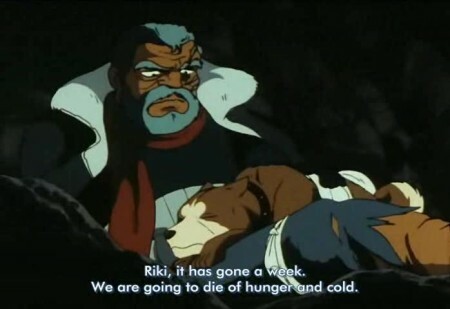 With their food having long since run out, Grandpa decides to use a conveniently placed meat cleaver to kill the dog for food, but swiftly changes his mind and tries to force the dog to eat him instead. Fortunately for both, the plot swiftly catches up with them when Akakabuto randomly decides to reappear and resume the attack. 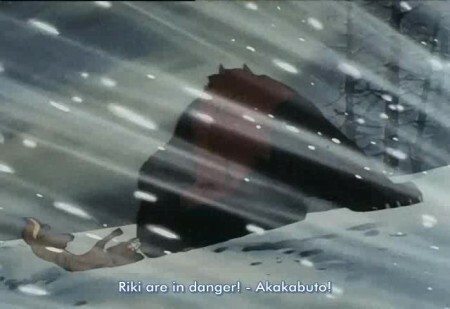 Despite being too weak and injured to move mere moments ago, Riki suddenly gains the power to launch an attack on Akakabuto, delaying the bear long enough for Gin and Daisuke to arrive. 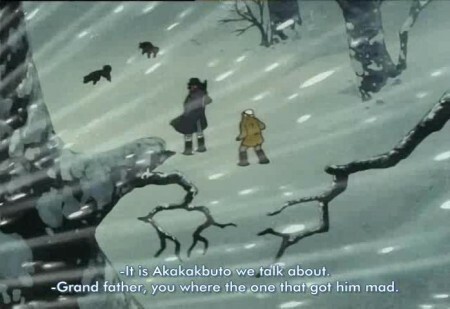 Naturally, Daisuke’s first impulse is to attack, which somehow ends up with his falling into the cave with Grandpa, whilst Gin is left unprotected on the snow. 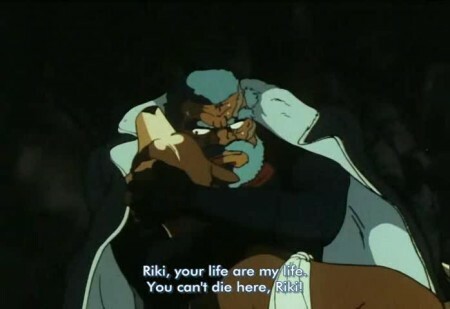 Riki is quick to rescue him, but with his son safe the older dog is now expendable, and dies a noble and heroic death. 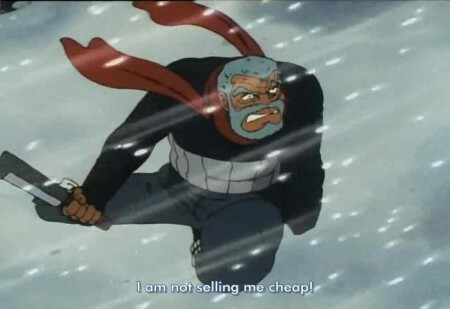 Suddenly invested with new plot power, and strangely bereft of his right foot (yet free of blood, infection or much in the way of pain), Grandpa drags himself out onto the snow and prepares to die- only for Akakabuto to realise that the episode is coming to an end and suddenly retreat. Now it shall fall to Gin to realise his destiny of defeating the bear, who will conveniently continue to wait until the end of the series for a proper confrontation. 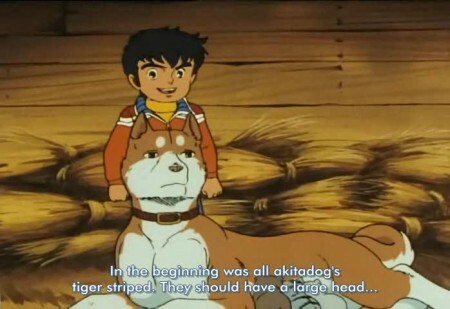 This entry was posted in Retro Cheese and tagged Ginga Densetsu Weed. Bookmark the permalink.